Stay at this tree house in Kumily, near Thekkady and get a chance to see hornbills and woodpeckers right from your bedroom! 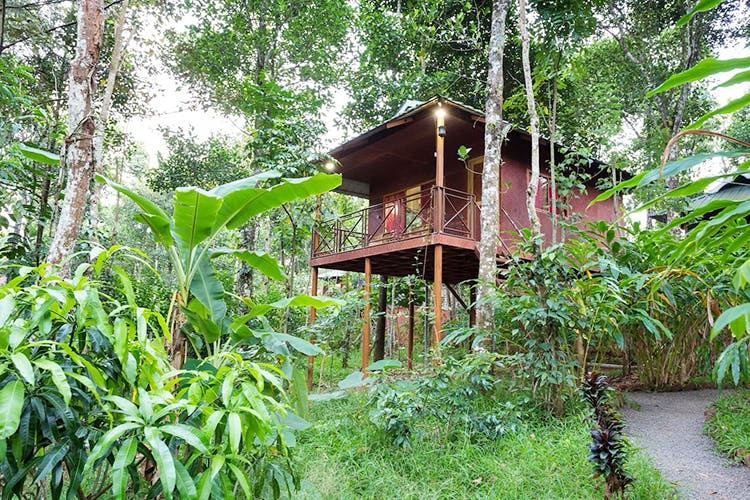 This exotic Airbnb property is actually a collection of five identical tree houses situated inside a thick cardamom plantation in Kumily. Each tree house is a cottage elevated 10 feet off the ground with stilts, very similar to a macha and can house two people comfortably, with space for a third if need be. So if you’re a big group of 15 you can actually rent all five tree houses! Having said that getting up to the tree house is through a ladder, which may not be suitable for everyone, so do keep that in mind. Each tree house comes with a private bathroom, balcony, and bedroom. The property is fairly spartan in terms of amenities, as there’s no TV or even air conditioning. But don’t worry the nights are usually below 21 degrees so you’ll sleep just fine, and there’s Wi-Fi with network connectivity so you’re not entirely disconnected from the world. Having said that, we do recommend disconnecting from the outside world and seeing what this property has to offer. First off you’re inside a thick lush plantation that’s frequented by up to 45 species of birds including exotic ones like the Malabar Grey Hornbill, Golden Oriolem and the tiny and cute Forest Eagle Owl. All of which can be spotted from your lookout. The surrounding areas are open to exploring, so if you’re up for it, you can even make your own little bird spotting adventure. Beyond that, we highly recommend visiting the Periyar Tiger Reserve for a safari or even a drive through as you never know if you may get lucky seeing a tiger! Speaking of large hungry animals, meals are provided to you by the staff at the property and their specialty is local Kerala cuisine. So get ready for some yummy fish curry and appam. All in all, we recommend coming here if you’re a nature lover looking to experience Thekkady. Prices for one night start at approximately INR 1,500 per person (at the time of this publication).